Note: Screenshots below are for ProGet v4, ProGet v5 screenshots are coming soon. This is a step-by-step guide to installing ProGet on Windows and provides some detail as to what's happening behind the scenes. There is just one installer for all editions of ProGet, which you can download from download on inedo.com. We've never had any issues with compromised installers (it's hosted on Amazon S3, which is quite reliable), but it doesn't hurt to make sure the signature is there. Take a quick read of our license agreement. Really, it's quick. After accepting the license agreement, select the edition of ProGet you'd like to use (Free or Enterprise Trial). Otherwise, you'll need to point to an existing server using a standard SQL Connection string. Note that if no database is specified in the connection string (which is the default), a database named ProGet will be created. By default, the installer will configure ProGet to use its own web server. This is the easiest to start with, and you can always switch to IIS hosting later. 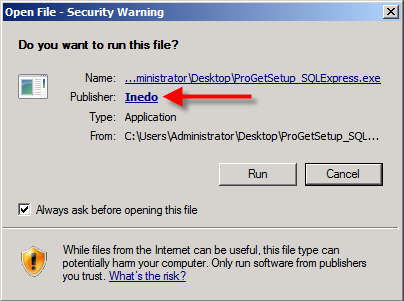 If IIS is installed on the server, you will have the option of installing ProGet in IIS. This will create an application pool and website in the local IIS configuration. By default, the installer will use the Network Service account to run the ProGet Service and Web Application. We Recommend sticking with this, and changing the account later if you need to. If you chose to have SQL Server Express installed, then the actual installation process will take a while, as the installer must download the SQL installer and then wait for it to complete. On some servers, we've seen this take as long as fifteen minutes. Clicking cancel (especially during the SQL Express installation) is not advised, as you may have to manually remove some bits of SQL Server using Add/Remove programs. Once everything's done, you'll be ready to start using ProGet.